What do we like for breakfast? OATS. What else do we like? PEANUT BUTTER. Any reason not to stick those two things together? Let me think about that... err, none that we can think of. 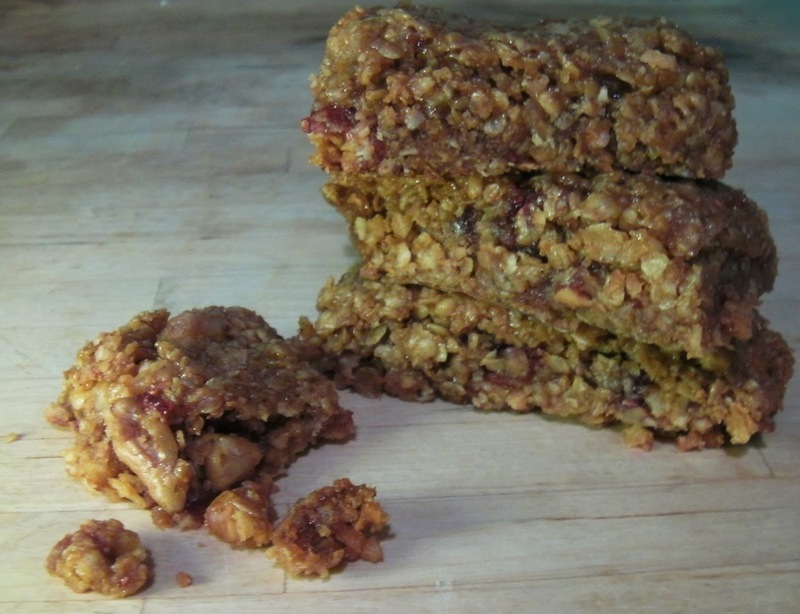 This recipe is a PB&J riff on Caleigh's wondrous gluten-free breakfast bars; the love-child of a flapjack and a peanut butter and jam sandwich. Some people insist on US-favourite grape jam whenever there are peanuts involved, but I'm going European with blackcurrant. Of course, you can replace with whatever flavour you fancy, strawberry, apricot, raspberry... chocolate spread. Fiendish. Preheat the oven to 160 C / 350 F / gas mark 3. Line and grease a small baking tin. (e.g. 20cm x 20cm) Grease it WELL because you don't want these chaps to get stuck later. Place the butter, sugar and golden syrup together in a pan and melt together over a medium heat. Remove from the heat and stir in the peanuts and oats. Tip half of the mixture into the tin and smooth over. Add a splash of hot water to the peanut butter to make it a bit more spreadable, and dollop a layer over the oat mixture. Repeat with a layer of jam. Spoon the remaining mixture over the top, smoothing out to the edges, and press down well. Bake for around 30-35 minutes until golden. Allow to cool for 5-10 minutes before cutting into bar shapes, and leave in the tin until completely cool.